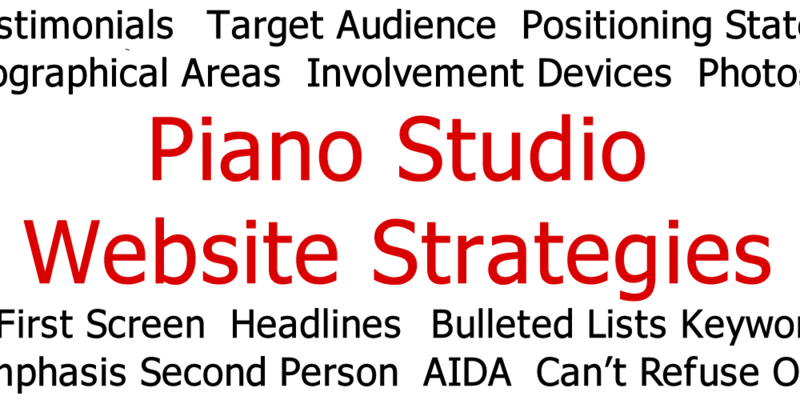 In Part 1 of this series, I discussed the first five of 25 strategies for creating a professional piano studio website. And now, the next five. 6. Who Will Write Your Copy? “Copy” is the advertising term for writing that sells. Apart from educational content you have on your site – like this article – all the writing on your website should be written to sell. You probably wouldn’t hire a writer to design a layout for your website (see below), yet small businesses like music teaching studios all too often rely on non-specialists like web developers or graphic designers to write their website’s copy. If you feel confident in your writing skills, the best person to write your copy is you. If you don’t feel confident in your writing skills, hire a professional writer. 7. Does Your Layout Help Readers Focus or Distract Them? Don’t let an unusual design distract your readers. You want your prospective students to focus on your message (the copy), not the messenger (layout and design elements such as logo, color choices, images, links and other prompts). Don’t think that your site’s layout must be original. Go with a conventional layout, with a header (your studio’s name, optional logo, optional tagline, and location) main content area (perhaps divided into more than one column), an optional footer area, a left or right sidebar, and prompts that are easy to follow. 8. Have You Chosen a Background, Font Size and Line Width that Assists Readers? Choose a background for your site that makes reading easy. A white or light gray background works on almost any website. Avoid white text on a dark background at all costs – except possibly for small contrasting areas. Use a font size that’s easy to read without zooming. In my opinion, many websites use font sizes that are too small for older adults, i.e. many of your adult students and/or parents. Keep lines of text between 50-70 characters long. Less than 50 and readers’ eyes get tired from the frequent shifts to the next line. More than 70 and their eyes may get lost in the copy. This is why most websites will benefit from being broken up into more than one column, or alternatively contain a primary content area and one or two sidebars. 9. Are You Using Photos and Other Images to Complement Your Content? Photos are vital on websites; include at least one or two on your home page. Photos with people are best; photos of people doing something (playing piano?) are even better. Of course, each image should be relevant to your copy, yet not so entertaining that they divert readers’ attention from it. 10. What Tone Do You Want to Project? Remember that the only worthwhile copy is copy that prospective students will read. Your copy’s tone reveals your studio’s personality and helps distinguish you from other teachers. Tone means the words you use and the length and structure of your sentences and paragraphs. A conversational yet motivating tone is usually best. To discover the right tone to use, ask: What is my teaching personality? Formal or informal? How do I want to come across to my prospective students or parents? Learn more about choosing an optimal tone. How many of these strategies can you implement before reading about Strategies #11 through #15 in Part 3 of this series?